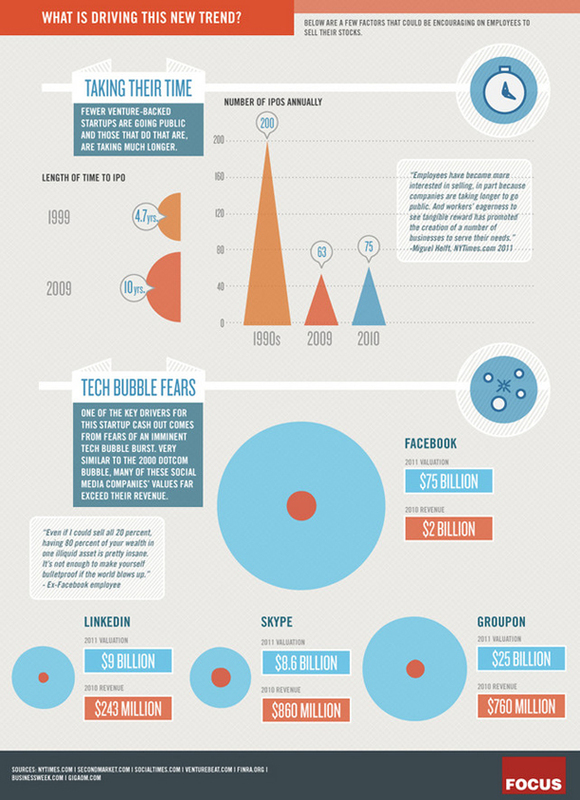 Infographic Of The Day: Relax, There’s No Tech Bubble Here! Everyone says we’re in the midst of another bubble. But there are signs that Silicon Valley has learned a bit since the tech crash of 2001. And as the bottom portion of the infographic above shows, the big company driving most of that activity is Facebook. (It’s telling, I think, that Groupon’s founders have been far more willing to cash out than Facebook’s: The daily deal rage is a far shakier business, with huge new competitors every day. Of course you’d want to get out now.) While those private trades are generating spectacular wealth, Facebook does have a tangible success story behind it — there’s no arguing about its user base, wide-reaching influence, or ability to bring in cash. Facebook’s very success — and the sheer unlikelihood that anyone could ever hope to emulate it — probably tamps down speculative rage for other, similar services. Unlike 2001, your grandmother isn’t pooling all her cash in tech stocks. The mania might seem large, but it’s at least stable rather than cresting. Compare: In 2000, investment activity in tech peaked at $27 billion in a single quarter. Today, that number is $9 billion, and the curve has flattened. And the market isn’t giving incentives for people to get crazy, either: The bumpy rides suffered by LinkedIn and Pandora haven’t exactly made an IPO look like a sure bet for cashing out. Looking at the final set of charts above, what surprised me most wasn’t how insane the company valuations are compared to revenues — that’s to be expected with any new company. What surprised me most was that there actually are revenues there to begin with. LinkedIn made $243 million in 2010, Groupon made $760 million (and will likely top $2 billion in 2011). There’s no denying that these are real businesses. There’s certainly some wild speculation going on, especially on the part of venture capitalists. Those guys seem pretty happy to throw $41 million into the trash, which certainly indicates that something is broken. But unlike in 2001, that speculation isn’t getting cranked up to 11 by day traders and soccer moms. That’s actually reassuring. The last thing we need in the stock market now is another wild card.